Hoshiarpur: Sharpening its focus on Punjab’s independence from Indian yoke, the Dal Khalsa supported by Akhand Kirtani Jatha will organize a demonstration at Ludhiana to mark India’s 70th independence anniversary. Asserting that there was no reason for Sikhs to celebrate August 15, the organization gave the call to employees, school managements and students for boycotting the state sponsored programmes to celebrate the Independence day. 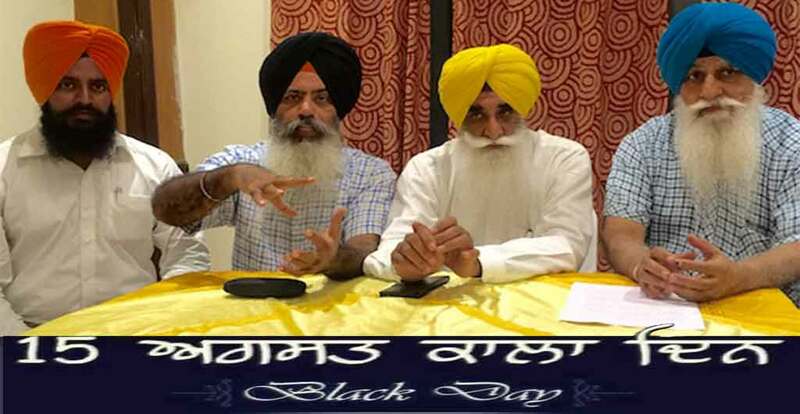 Addressing the media persons here today, Dal Khalsa president Advocate Harpal Singh Cheema said by observing August 15 as black day, the aim was to keep the desire for freedom alive. While Muslims and Hindu brethren attained freedom on 14th and 15th respectively, unfortunately Sikhs missed the opportunity and got trapped into another political subjugation, stated the policy statement of the Sikh nationalist group. Since 1947, we have experienced slavery, torture and abrogation of our civil, economic, religious and political rights. In a significant development, Dal Khalsa appealed to Hindu brethren of Punjab to ‘bridge the divide’ and join hands with Sikhs not only to safeguard the interests and resources of the state but also to achieve Punjab’s Sovereignty in the same manner as Sikhs helped Hindus in their fight for the independence of India from British colonial rule. Flanked by ex-president Harcharnjit Singh Dhami and spokesperson Kanwarpal Singh, Advocate Cheema denounced the Indian state for not acknowledging the Sikh right to self determination in accordance with international treaties and covenants that all democratic Nations are expected to adhere to and oblige. Dal Khalsa today categorically opposed the cow tax leveled by the state govt through various channels including electricity bills, registration of new vehicles etc. They said apart from Hindu community, rest of other communities does not revered cow as their mother or a sacred animal. They said the state that claims to be secular can’t impose fresh taxes in the name of cow. He said the problem of stray cattle’s is serious and can’t be solved by imposing taxes on ordinary persons. Referring to atrocities heaped on Dalits in Gujarat and elsewhere, they expressed their pain and concern over the maltreatment and high-handedness meted out to Dalits by Hindutva forces supported by state establishment. Dal Khalsa pledged sustained Sikh support for Kashmiri people in their struggle for right to self determination in line with deepening partnership between the two pro-struggling ethnic minorities.